From the editor and magazine that started and named the Occupy Wall Street movement, Meme Wars lays out the next steps in rethinking and remaking our world with a new economic paradigm. Like Adbusters, the book is image-heavy and full-color throughout, and includes contributions from Nobel Prize winner Joseph Stiglitz, Paul Samuelson, George Akerlof, Lourdes Benera, Julie Matthaei, Manfred Max-Neef, David Orrell, Paul Gilding, Mathis Wackernagel and the father of ecological economics, Herman Daly, among others. 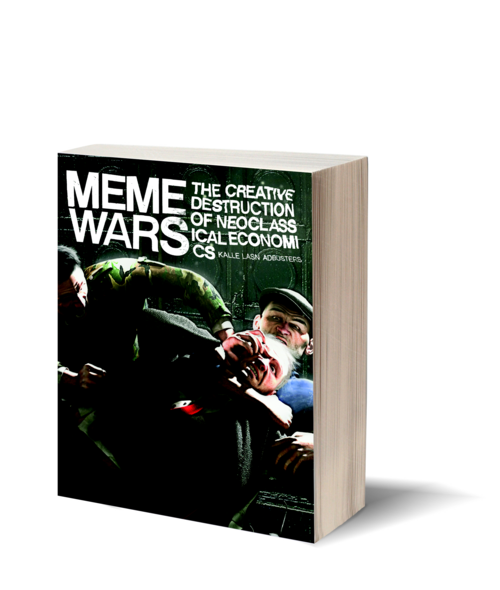 Meme Wars presents a new way of looking at our world that challenges and debunks many of the assumptions of neoclassical economics and brings to light a more ecological model. It takes into account psychonomics, bionomics, and other aspects of our physical and mental environment that are often left out in discussions of economics. Author Kalle Lasn calls it "a textbook for the future" that provides the building blocks, in texts and visuals, for a new way of looking at and changing our world. Through an examination of alternative economies, Lasn spurs students to become "barefoot economists" and to see that a humanization of economics is possible. Based on ideas that were presented in a special issue of Adbusters titled "Thought Control in Economics: Beyond the Growth Paradigm / An Activist Toolkit," here is a book that will continue to pave the way that the Occupy Wall Street movement began. Check out a free pdf of Meme Wars: A Student Guide.